The wailing wall they call the scorer's hut became a place of prayer for Graeme McDowell and a confessional for Shane Lowry. McDowell, the 2010 champion, resumed US Open business with a satisfying level-par 70 in early morning showers, consigning the 36 putts he had in Thursday's 79 to the outer regions of his memory. At nine-over par, the Portrush native (38) was bracing himself for the disappointment of missing the cut, even if he was projected to finish among the top 60 and ties. A 32-putt round would not normally give him reason to be cheerful, but after the carnage of day one, he was pleased to remind himself that he's playing well and hadn't been "US Open-ed" - the phrase he used to describe the mental torture that even top PGA Tour professionals endure in mid-June every year. "If I had shot another 75 today I'd have left here very disappointed because my game is in good shape at the minute," McDowell said, some 40 minutes before a dejected Lowry trooped home to sign for a 79 that left him hopelessly outside the cut line on 14 over. "So that was pleasing to do as well as I did, especially on that back nine. If it misses, it misses. Fine. At least I know I am still hitting it good. "Thankfully, I have managed to play decent tee to green and not get US Open-ed and walk away thinking I am not playing well." Out in two over after following a birdie at the third with a bogey at the treacherous seventh and a double-bogey at the ninth, where he three-putted from 20 yards, McDowell was thrilled to come home in two-under thanks to birdies from nine feet at both the 10th and 16th. 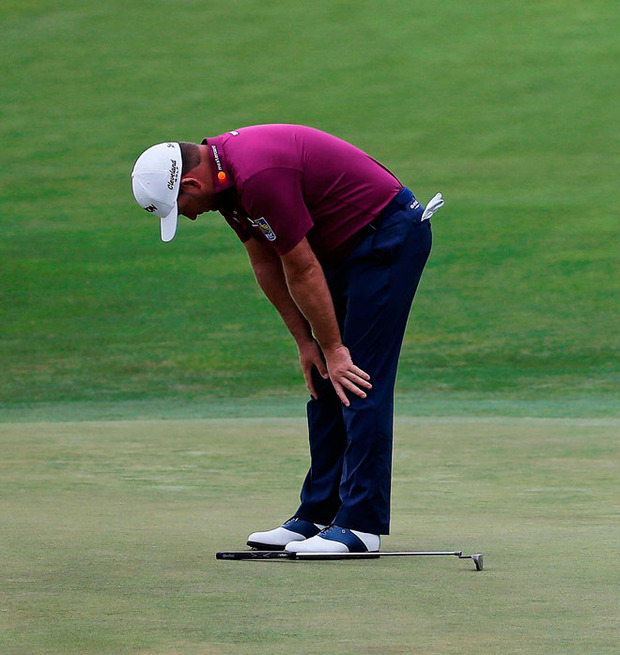 Whatever about the weekend, a much-improved putting performance was reason enough for celebration. "I count myself as one of the better putters in the world and I had 36 goes yesterday and it wasn't a technique thing," McDowell said. "The pins, especially yesterday, were vicious, coupled with the fact the greens didn't putt well and were very crusty with lots of footprints." Summing up his round as "a good hang", McDowell was praying for two more rounds, safe in the knowledge that a level-par weekend would turn a nine-over total into "a great cheque on Sunday." He wasn't moaning about the set-up, just left a little bruised in the ego department after the USGA placed the pins in such difficult spots that one of Lowry's supporters joked that it was "good of them to put them on the greens today". Lowry shot 75 on Thursday despite having three three-putts and a four-putt and declared: "I can't play any better golf than that." He was hoping to get out yesterday, shoot 70 and put himself in the mix. Paul McGinley used to joke on such days that "there's a goalkeeper in the hole and he's playing a blinder." But Lowry was in no mood to be consoled. "I wasn't even hitting the goal, so the goalkeeper had nothing to deal with," he said. "Yesterday I done myself in playing so well and not shooting the score I needed to. "Today you want to get off to a decent start and I three-putted the first. I gathered myself after that, but if you hit it in the rough, you can't make par." The big numbers on the leaderboard were no consolation for the 2016 runner-up when it was suggested that "everybody" was having problems. "Dustin is four under, so it wasn't everybody," he said. Then, cutting himself a little slack, he said: "It is not the end of the world. This course will beat you up, even on the best of days."